The Helsinki to Stockholm ferry connects Finland to Sweden and is operated by Tallink Silja and Viking Line. As well as comparing prices and times for Helsinki to Stockholm, we will also show you results for Naantali to Kapellskar and Turku to Stockholm to help you get from Finland to Sweden at the best time, for the best price. The average price found by our customers for Helsinki to Stockholm recently is 190 €, with Viking Line. Book a Helsinki to Stockholm ferry today with AFerry. Just use the form above and choose the route that you want. If nothing appears automatically, start typing Helsinki. You can also type the country or even the name of the ferry company you are interested in. When you have the route that you want, choose single or return and all the other options you want. If there is more than one ferry company operating on the Helsinki Stockholm route we will show you all the ferry companies, to make sure you get our best price. We'll also show you any routes similar to Helsinki to Stockholm so you have the complete picture when making your booking. And of course you'll also see a range of times just in case it's a bit cheaper earlier or later than your preferred booking time. Once you've chosen your perfect sailing and have made your booking we'll email you your booking confirmation for your Helsinki to Stockholm ferry. The majority of tickets have instant confirmation. Below you can see the ferry company or companies that sail on the Helsinki to Stockholm route and the journey times. You might also see some recent prices our customers have found. The best way to find a cheap Helsinki to Stockholm ferry though is to use the form above today to see all of our possible choices. With AFerry we always give you our best prices for ferries from Helsinki to Stockholm. No matter which page you book from we always include all our special offers. And there is no need to look for a discount code. If we have an offer available, your ferry price will include the reduction or offer. There's no need to look at other websites. If you're not sure if the Helsinki to Stockholm route is right for you or you can't decide between ferry companies, if there is more than one, you might also find it useful to read any reviews we have available. We ask all our customers to send us reviews for Helsinki to Stockholm ferries. Remember though, that the earlier you book, the cheaper prices normally are. So don't spend too long deciding! Helsinki to Stockholm is a popular route, so we advise you to book as soon as possible. Helsinki's ferry port lies on the southern coast of Finland, resting on the Gulf of Finland in the Baltic Sea. Helsinki is the busiest ferry port in Finland with over 6 million passengers passing through it annually and offers a number of connections to Sweden, Estonia, Germany and Russia on a daily basis. These can all be booked online with AFerry. Stockholm, Sweden's capital, is made up of 14 small islands, each distinct in character and mood; from the upmarket Östermalm and the bohemian Södermalm to the historic Gamla Stan. Stockholm is often referred to as the `Venice of the North', with its pretty islands and 52 connecting bridges. Stockholm is also considered to be the capital of Scandinavia, and is a popular tourist destination offering visitors beautiful landscape, stylish boutiques, stunning art galleries and much more. 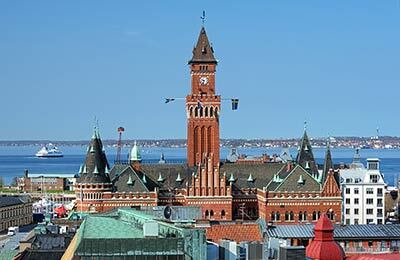 Stockholm offers its visitors an array of exciting things to see and do. Museums include the Skansen open-air museum of Swedish life and culture, with historic buildings, working farms, a zoo and an aquarium. 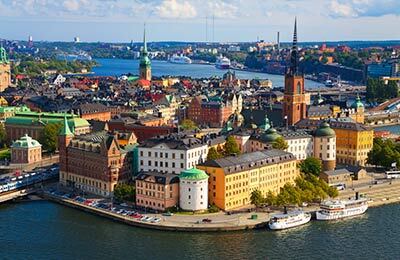 There is a vast number of walking tours and excursions to enjoy in Stockholm, and many important buildings to visit. The Royal Djurgarden park is an island consisting of beautiful parkland and forest, and the Old Town of Stockholm offers the Drottningholm Palace, which is the home of the Swedish Royal Family; and the remains of the Viking settlement, Birka. History lovers can take a guided city tour, which is offered in many different languages. There is also plenty for younger visitors to do in Stockholm, from the Junibacken park, the wonderful world of master story-teller Astrid Lindgren, to attractions such as the Museum of Music, the Toy Museum and Skansen's Aquarium.